mechanicsupport.com: Rough Engine on left mag - nothing you do fixes the problem! Rough Engine on left mag - nothing you do fixes the problem! Nothing you do will fix it. Mag check -- engine coughs and sputters on left magneto. So lets replace the harness "just in case" --Success engine runs fine. 10 hours later problem returns! One other item interest; can't lean engine, as soon as the mixture is pulled back the engine sputters. The big hint here is the mixture control. It points to the carburetor and only the carburetor. But why just on the left magneto? Lets say you have crappy fuel atomization and fuel distribution. Not real bad, but just bad enough. With two spark plugs firing it ignites a leaner mixture and the engine runs fine. But lets impar the ignition system slightly by weakening it. Turn off 1 magneto and now try to ignite the mixture - it can't do it as well and the engine coughs and shudders. Lean out the mixture just slightly and now even with sparks flying out of two spark plugs it can't ignite the mixture every time. It misses a few strokes then enough fuel has gathered that it ignites and burns and then the cycle repeats. The carburetor nozzle was replaced and now the engine runs fine. Start with the easy and inexpensive and work your way from there. 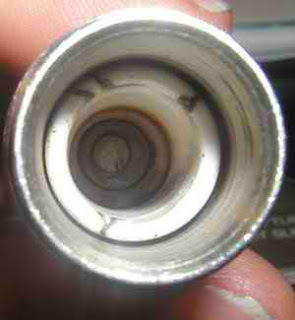 The spark plug should be one of the first items you check. A spark plug resistance check is a fast and easy method. You will need an inexpensive ohm or multi-meter. 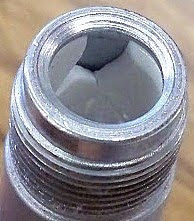 Spark plug terminal well showing arching lines. Plug lead is arching to ground by way of the plug metal shell. Replace plug. At the bottom of the well there is a contact. Check spark plug resistance by placing 1 end of the ohm meter lead to this contact and the other end of the lead to the center electrode on the firing end of the spark plug. Resistance should be 800 to 1200 OHMS. Replace any plug above 5000 OHMS. 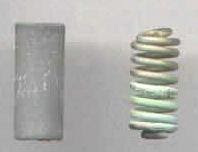 This is what the resistor looks like inside a Champion REM40E spark plug. One reason why not too drop spark plugs and a good reason why to carefully inspect the terminal well (shown here) for cracks. Regarding 'Rough on left mag'; why wouldn't you get the same results on the right mag?